Never one to be outdone by anyone in the crazy stakes – enthusiast motherboard maker, DFI, has tweaked its already crazy TransPiper cooling system for its motherboard with a more enthusiast friendly approach. What DFI has done is to balance the benefit of heatpipes, but also include the ability to customise how the motherboard is cooled. 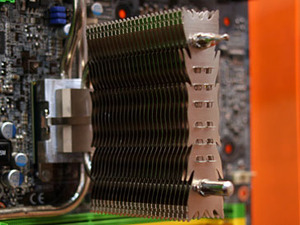 For starters, the rear fins that sit outside the case and are cooled by the rear exhaust fan now have two heatpipes, instead of one, and secondly DFI has worked with Thermalright to include an interchangeable north bridge cooler. As standard, a small aluminium block sits on the north bridge and a small passive cooler is then clipped to the top, but DFI demonstrated that by buying an additional Thermalright north bridge cooler, it could be interchanged with very little effort offering far better cooling. Obviously, this is at extra cost, but it’s still cheaper and less time intensive than finding replacements for all the heatsinks the heatpipes cover. In addition, when you’re already spending an arm and a leg on its X48 board and DDR3; the best is already being bought so it’s a no brainer extra to add to that where possible. In this respect, we think DFI is certainly shooting in the right direction – when you’re looking at the the compound benefits of all these extras, features like this and the core features you’d exepct from DFI – the eight phase digital PWM and incredible BIOS options should all add to the experience. 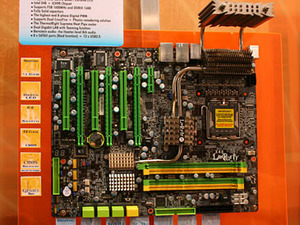 Alternatively, DFI has its own Nvidia nForce 790i SLI board in the works which should also come with the Transpiper cooling – it also includes all the popular feature like Bernstein audio, eight phase digital PWM, eight SATA 3Gbps ports, all solid aluminium capacitors, dual Gigabit Ethernet and 3-way SLI as you’d expect. 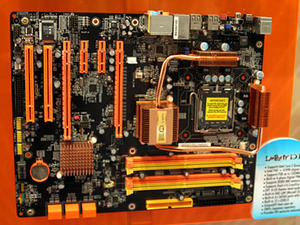 For those without hundreds to spend, the P45 T2R also looks like an interesting proposition – DDR2 based and with the Intel P45 chipset it doesn’t feature the Transpiper but still gets the orange and black DFI treatment and copper heatpipes to match. This board still has a four phase digital PWM with 16 mosfets, but expect the usual enthusiast grade DFI BIOS support. By the looks of things it features an awesome looking layout and also claims to have dual PCI-Express 2.0 x16 CrossFire (although we expect that to be two electrical x8 slots), two types of Rear I/O S/PDIF, a single Gigabit Ethernet, 100 percent Japanese capacitors and the usual onboard power/reset switches. It’s not bling flashy like a Republic of Gamer or Quantum Force board, instead it’s stylish and subtle and as a DFI you’d expect it to run like turd off a stick. We’ll be sure to get a board and find out the exact details for you! In the meantime, let us know your thoughts in the forums. 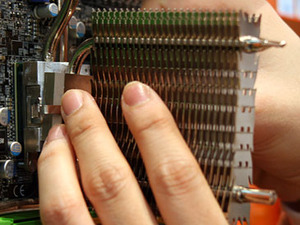 Thermacore has been granted a contract from the US DARPA to develop air-based cooling technologies for military hardware.